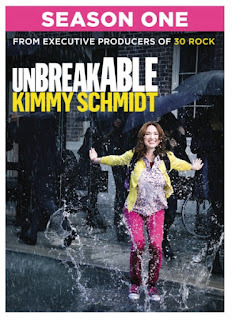 Something to Muse About: Unbreakable Kimmy Schmidt: Season One is coming to DVD March 8th! Unbreakable Kimmy Schmidt: Season One is coming to DVD March 8th! If you couldn't get enough of the plucky mole woman from the Netflix original series Unbreakable Kimmy Schmidt, well you're in luck. It's making its way to DVD on March 8th! Which should give you just enough time to relive, or catch up on the series before the second season premieres in the Spring. Synopsis: From the executive producers of 30 Rock (Tina Fey and Robert Carlock) comes the "wise, wicked comedy" (Jeff Jensen, EW), Unbreakable Kimmy Schmidt. Rescued after fifteen years in an underground doomsday cult, Kimmy (Ellie Kemper) decides to rebuild her life in New York City armed with only a fifth-grade education and a firm belief that truly anything is possible. She quickly finds a roommate, Titus Andromedon (Primetime Emmy® nominee Tituss Burgess), a job working for a spoiled Manhattan mom, Jacqueline Voorhees (Primetime Emmy® nominee Jane Krakowski), and a new beginning. Watch season one of the Primetime Emmy®-nominated series on these shiny discs that Kimmy is only now just learning about! That's all thirteen episodes, back-to-back and uninterrupted, of the show critics rave is "packed liked 30 Rock with surreal zingers" (Emily Nussbaum, The New Yorker).